Recording in your home studio with the best vocal mic that you can get is one of the easiest ways to upgrade and improve the quality of your songs and productions. Lead vocals are the focal point of any song – using the right mic will help them to stand out and connect with the listener. But although there are loads of different opinions on what microphones make the grade, the same ones seem to pop up time and time again in lists of recommended mics. 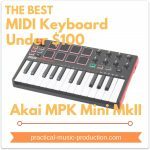 The models below are some of the best you’ll find for recording vocals, and are designed to fit different levels of spending plan as well. Capturing a successful recording starts with the right mic, but it’s also good to remember that every singer’s voice is different, and a microphone’s response will depend massively on whether it matches the voice singing into it. 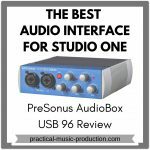 If you’re looking for a basic, low-cost, entry-level mic that will still give you excellent vocal recordings, then you might want to try this out. Audio-Technica have a strong reputation for building microphones, so it’s no surprise the AT2020 produces fantastic recordings at such a low price. The AT2020 has now become themicrophone that all other similarly-priced mics are judged against – a true sign of its quality. One of the biggest-selling microphones in the world, and it’s equally at home on the stage as well as the studio. The SM58 has become one of the industry-standard mics used for recording vocals in the home studio. The mic is tough and solidly-built, so it’s very unlikely to break if you accidentally drop it. It’s cheap, and versatile too – perfect for recording guitar amps, bass amps, and snare drums. The sound it produces is warm and rugged, one of the reasons why it’s so popular for recording vocals. The NT1-A is a fantastic all-round mic that captures warm and clear recordings with ease, and it’s a great mic for both male and female vocalists. The wide frequency response plays a huge part in this, along with the small presence boost at the top-end of the spectrum. If you’re looking for a top-quality condenser mic for your home studio that will bridge the gap between the lower-budget and the higher-budget models, then the NT1-A is what you need. 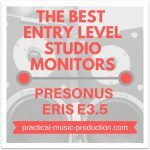 It’s simple, straightforward, and very highly regarded in recording circles. The sE2200a II C isn’t just a great vocal mic for a home studio, but it’s also widely used in commercial studios as well. It was actually the main mic used to record Amy Winehouse’s vocals during the sessions for ‘Back to Black’. Stretching your mic budget for the sE2200a is easily worth it. You’ll find yourself capturing beautifully clear and detailed recordings, with a smooth top-end and a tight low-end. The onboard low-cut filter and -10dB pad are two features that really help to push this extra quality as well. Along with the NT1-A, it’s easily one of the best vocal mics in this price range – a superb all-round performer for any home studio. In fact, once you’ve used it a few times and heard how good it is, you’ll probably find yourself using it over and over again as your best vocal mic. A true legend – you’ll see this mic being used in most commercial studios all around the world. Yes, the price is a massive step up from the other choices here, so it would be a bit of a luxury for most home setups. But if you’re ready to take that next step and invest in a top-of-the-line vocal mic, then this is one of the ultimate choices. The C414 is designed to capture amazingly rich recordings, on both vocals and instruments. The flexibility you get with pickup pattern choice is pretty amazing, and you also get a selectable pad and high-pass filter to help with louder signals or low-frequency vibrations – all leading to cleaner and more accurate recordings. 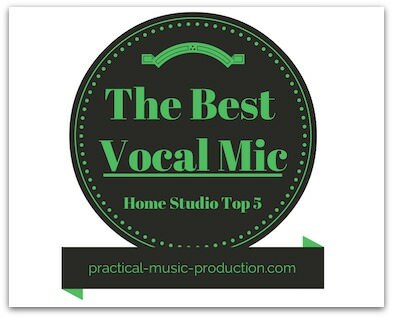 When it comes down to choosing the best vocal mic for your own studio, you want to give yourself the best chance of success by sticking to the recommended models that you know will give you the recordings you strongly desire. There’s not much point in reinventing the wheel when it comes to mic choice. If you’re on a tight budget and you’d like to pick up both a condenser and a dynamic, then get yourself a combo of the AT2020 and the SM58 – two great mics that do the job with a minimum of fuss. 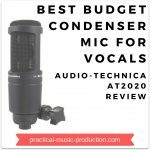 If your budget stretches a little further, then take a look at the other condenser mics – the NT1-A and the sE2200a. Your vocal recordings will sound richer and more vibrant, and the extra quality will shine through in your productions.